The Warrior Dash mixes endurance with obstacle courses and a healthy dose of mud. Just when you thought cyclocross was the most badass recreational sport to take root in the Northwest, along comes an entire new category of events for the endurance-obsessed, adrenaline-junkie mud lovers among us: obstacle courses. If you’re a distance runner, iron man/woman, triathlete or weekend athlete who loves a challenge (and doesn’t mind getting dirty), these races might be just what the doctor ordered. Come July, the best known of these obstacle-course series, the Warrior Dash, will make its Seattle-area debut at Meadowbrook Farms in North Bend. Started only two years ago as a single event for 2,000 participants in Chicago, the Warrior Dash has grown by leaps and bounds. This year, 600,000 people are expected to jump, run and snake across its obstacle courses in 35 different locations worldwide. The North Bend course, stretching for “3.55 hellish miles,” according to organizers, will feature a wide range of challenges, including crossing through a swamp, climbing over hay-bale pyramids, navigating through bungee-cord webs, slithering through a completely dark tunnel and jumping over fire, all of which should serve to slow participants down and bring smiles (and a lot of mud) to their faces. One of the 18,000 or so “warriors” who’ll be on hand for the Warrior Dash in North Bend is Chris Hancock, a regional manager for an insurance company in Vancouver, B.C., and a competitive amateur distance runner in his spare time. Looking for something a little different to break up his training routine, Hancock made the trip to North Plains, Oregon, (about a half-hour west of Portland) last summer for the first-ever Pacific Northwest Warrior Dash. He liked it so much, he signed up for it again this year, along with the new races in North Bend and Whistler, B.C. One of the reasons Hancock loves the Warrior Dash so much, besides the challenging obstacles, is the camaraderie between participants, who are known to help one another over obstacles during the race and fetch one another a turkey leg and beer afterward. He also likes the festival atmosphere of the event: Besides beer and turkey legs (the Warrior Dash’s signature food), participants and spectators alike can enjoy live music from local bands while watching others tough out the grueling course. Mud runs run the gamut from moderate to maniacal. 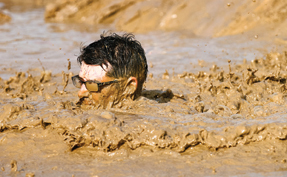 Here are five local ways to test your fitness, stamina and mud affinity. The Survivor Mud Run is an extreme 5K foot race and obstacle course at Remlinger Farms in Carnation (June 18; $55–$65; register by June 9 at survivormudrun.com). At the Warrior Dash in North Bend (July 16–17; $50–$70; register by July 5 at warriordash.com), participants are assigned a start time on one of the two weekend days of the event; running the course takes 45 minutes on average, and participants can spend the rest of the day eating turkey legs, drinking beer and enjoying live music. The Dirty Dash is an extreme 10K foot race and obstacle course which you can complete solo or in teams of 5 to 20. There is also a Piglet Plunge for the kiddos (under 12) from 12:30-1pm on race day. PGP Motorsports Park, Kent, WA (July 9; $35–$50; register at thedirtydash.com). Three other obstacle-course series, Spartan Race, Tough Mudder and the Gladiator Rock’n Run, are scouting potential locations around the Seattle area and hope to put on their own events in our neck of the woods this fall or in 2012. Spartan Race (spartanrace.com) was started by a group of long-distance ultra-athletes and a Royal Marine, and currently runs 30 events across the U.S., Canada and the U.K. Fewer than 20 percent of participants finish Spartan’s signature event, the Death Race, held once a year in Pittsfield, Vermont. The Tough Mudder (toughmudder.com), which bills itself as “much tougher” than the Warrior Dash, features 10- to 12-mile obstacle courses designed by British Special Forces agents to test all-around strength, stamina and mental grit, with an emphasis on cooperation and camaraderie—not competition—among participants. The Gladiator Rock’n Run (gladiatorrocknrun.com) is a 5K created by American Gladiators’ Dan Clark (aka “Nitro”); it features 14 obstacles and a raucous post-run party.